Once in a while, not often enough, I get to make stuff for my own kids. 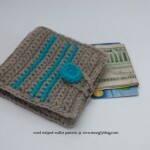 And this one was a request from my 6 year old middle child – a new wallet, just for him. He’s a little camera shy, so you’ll have to believe me when I say that this design made him very very happy. The Wool Striped Wallet isn’t just for kids though – it’s great for anyone who loves a little custom organization. 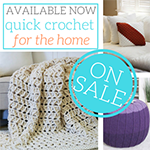 The crochet stitches are simple but the result is eye-catching and you can add as many pockets as you like to make it suit your own needs. 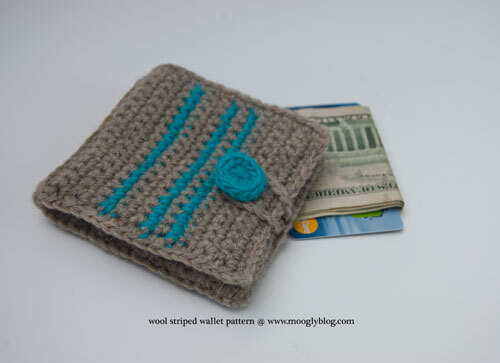 This wallet is made in three pieces that are then crocheted together, and I strongly recommend blocking all three pieces both before and after assembly for best results. You shouldn’t have to pin the pieces, just get them good and wet and then shape them on a towel to dry. Don’t rub too much – we don’t want them to felt, just to lay flat and even. 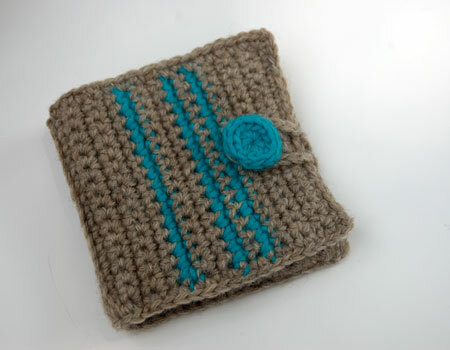 1″ Button, or make your own using the Simple Crochet Button pattern (shown). With Main color, ch 17. Row 21 – 25: Sc across. 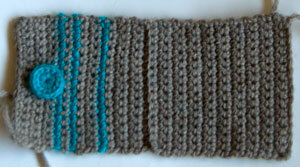 Use the Stripe color to finish the last sc as in switching colors for stripes, then ch 1 and turn. Row 38: Sc across. Break yarn and weave in all ends. 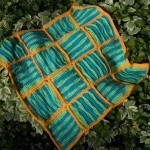 Add the button to the RS of the outer piece, at the end with the stripes, a few rows in. From the RS of the Outer Piece, on the end *without* stripes, join Main color yarn with a slip stitch in the 8th stitch from the right. Ch 17 (or long enough to go around your button if you are using a larger button), then sl st to the next st to the left (9th from the right). Break yarn and weave in ends. With Main color, ch 16. Row 26: Working in FLO, sc across. 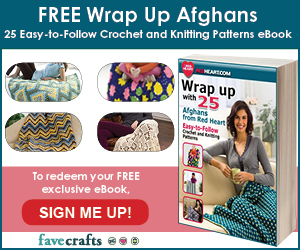 Break yarn and weave in ends. With Main color, ch 16, leaving a 12″ tail for later sewing. Row 8: Working in FLO, sc across. Break yarn and weave in last end, but leave long end. Gently block all the pieces! Blocking here is important to get all the pieces to lay as flat and thin as possible. Next, lay the RS outer piece on top of the WS inner piece (with attached pocket), with the loop end of the outer piece on your right, and the pocket at the very bottom on your left. Join the yarn with a slip stitch to the bottom left corner, and sc through all three layers, working across the bottom of the wallet. 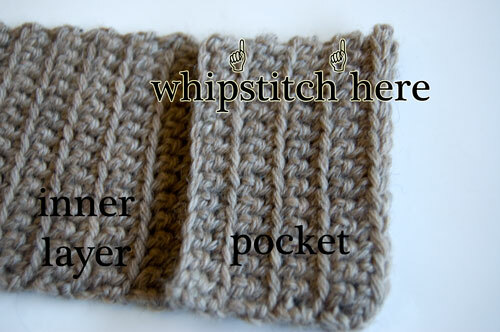 This joins the opposite edge of the pocket and the bottoms of the inner and outer pieces. When you come to the corner, ch 2 and sc along the side of the wallet. Work in the stitches where the loops are attached, keeping the hook on top and pulling the working yarn behind the loops. This sandwiches the loop and gives a good looking finished edge. Approaching the top of the wallet, the inner piece should be one row narrower than the outer, so work the last sc in the side through just the outer piece. Ch2 to get around the corner again, and then sc across the top of just the outer piece. To avoid a wrinkled edge, you may want to skip working a sc in every 4th or 5th row – play with your spacing here to get as flat an edge as possible. At the end of the top of the wallet, ch2 and start to sc the final edge together. 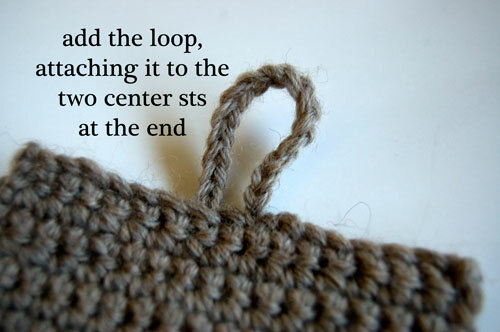 The first st will be just through the outer piece, but the remaining stitches will be worked through all 3 layers again – the inner, outer, and the bottom of the pocket. At the end of the side, ch 2 and break yarn. 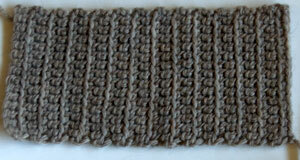 Use the seamless finishing to join to the first stitch. Block the entire wallet once more, working gently to avoid felting. Pull any wobbly edges even and let dry. Done! Hope you enjoy this pattern as much as my little guy does – let me know what you think in the comments! Be sure to Like the moogly Facebook page for the latest updates and have some fun with us! 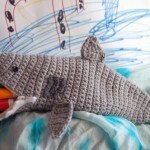 And if you like what you see but don’t craft, I take custom orders and commissions. Written pattern copyright mooglyblog 2012. 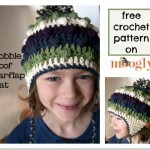 Please do not reprint this pattern, but feel free to link to this page to share this pattern with others. Thanks for sharing your wonderful tutorial!! I greatly appreciate you for sharing your hard work for free! 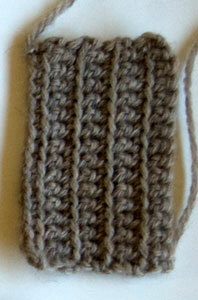 I am working on the wallet as we speak and it has inspired me to make a similiar design fitted for a cell phone. Fantastic work! CuriousTiff, thanks so much for your comments! 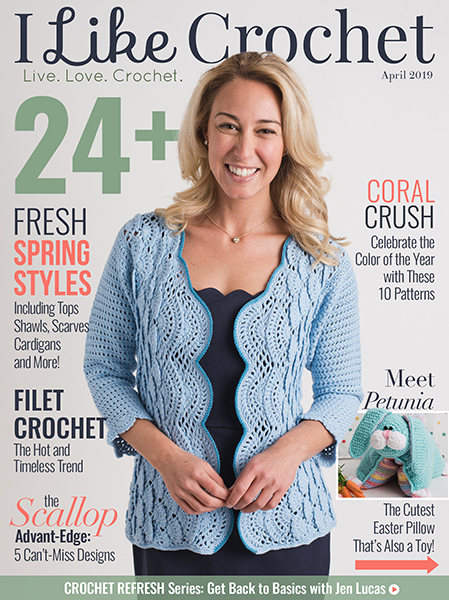 In fact, that simple crochet button from mrsmicawber is exactly the one I used – I link to it in the pattern specs! Great eye! Thanks for the real nice pattern. 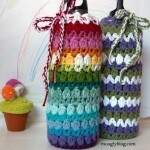 I am going to be adding this to my list of Christmas Gifts to Make. I’m glad you like it Cj! Thanks for commenting! Masha Allah !! !awesome project..i really liked it nd made one ,it has come out beautifully. 😀 Thank you Zakira! You too! Not for this pattern, I’m afraid. Hello there! 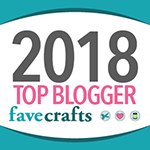 Your site is my inspiration for learning how to crochet! Thank you so much for your efforts! Hi Zarnaz, and thank you! 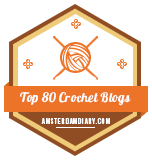 I don’t have a pattern like that yet – but I am actually in the planning stages for it! 😀 So stay tuned! I just made the inner side of the wallet but it is much shorter than the outer layer… Is it supposed to be like this? Outer layer was made of 38 rows and inner layer with 26 rows, right? hi! i also wonder why the length of the inner is only 26 rows while the outer length is 38 rows. the pocket is sewed right on top of the inner side, right? the height is fine with me, as the inner only minus 1 stitch from the outer. please help, i really like your wallet and about to make 2, one for me and one for my best friend. Because if they were the same length, then when folded there would be too much interior fabric. 🙂 The inside is smaller so it can fit inside the outer easily. 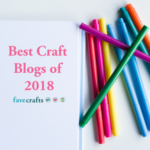 Since everyone’s tension is different, it should be just a bit shorter – try holding them together and folding them before you cut the yarn so you can adjust as needed. How do I do this with only one color? Ya know, that makes so much sense. I just figured there was a different technique if you wanted separate colors. HI Tamara, i really appreciate you getting back to me.. So your inner piece is a whole 12 rows shorter which is about 1/3 of the length of the entire outer piece and yet it still managed to be attached on 3 whole sides minus 4 stitches at the crease!? Maybe i just need more practice at doing this! LOL.. i am still a newbie to crochet, and i’ve only done scarfs so far for the most part. Please forgive me! But in trying to figure this out again today i realized something.. in the instructions you have us lay down the outer piece with the loop on the right (which makes the button side on the left) and then you say to put the pocket side of the inner piece to the LEFT as well, which means the pocket would be on the button side, but i now see in the open picture of the open wallet near the top of the tutorial that clearly your pocket is on the LOOP side! i think this is why mine was opening upside down.. it seems that the pictures and assembly instructions do NOT match each other! i thought i’d point that out just in case anyone else has problems trying to assemble this thing, not to criticize you or be a pain in the arse.. 😀 i do love this style of wallet, and love how yours came out.. now if only i can get mine to work! Ha! Hi Tamara, I have the same doubt. The inner piece is 12 rows shorter than the outer piece. If I exclude the 4 rows for the crease, then it is still 8 rows. 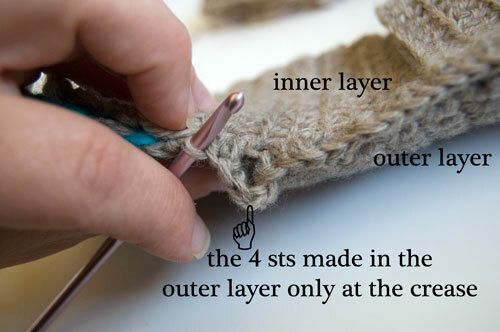 Do you stretch the inner piece to join it with the outer so that it fits end to end? I have tried to explain my situation with the below diagram. The top row is the outer piece. The bottom row is the inner piece. The ^^^^ signifies the crease. Which configuration is the correct one? It would be very helpful, if can reply. Thanks for your pattern. Hello Soubarna! 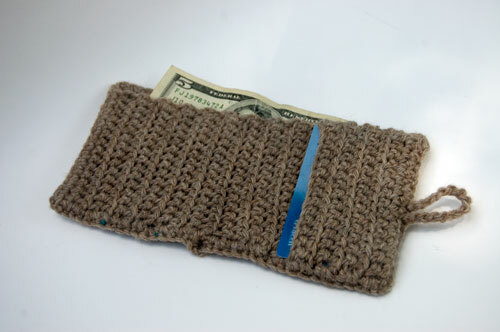 Option C – the inner piece is smaller so that it fits inside when the wallet is folded.